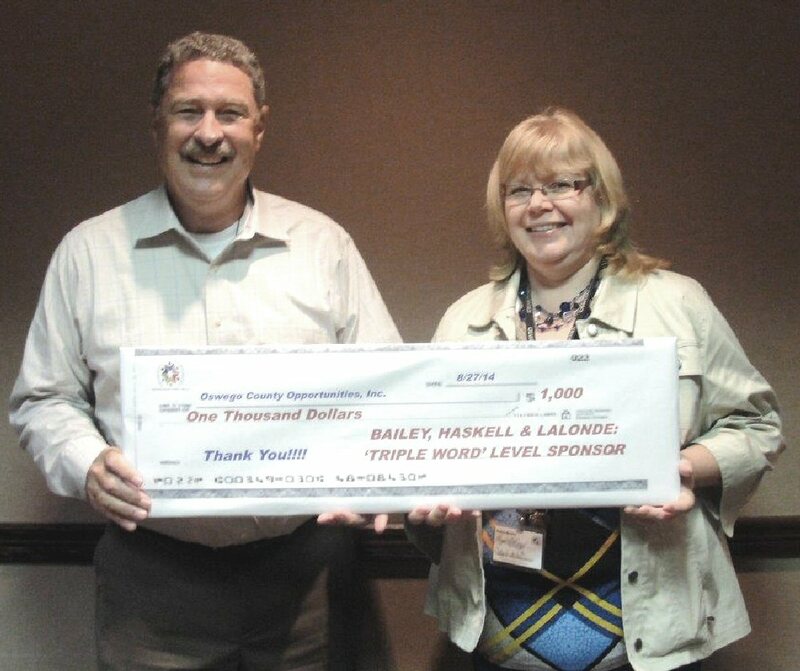 OSWEGO, NY – Bailey, Haskell and LaLonde is a $2,000 “Triple Word” level sponsor of the eighth annual Diane Falise Memorial Scrabble Fest. This benefit for Literacy Volunteers of Oswego County, will take place on Sept. 19 at the Oswego Elks Lodge. Jim Murphy, representing Bailey, Haskell and LaLonde, poses with Betsy Copps of Oswego County Opportunities, representing the Scrabble Fest Committee. BHL is a “Triple Word” level sponsor for the fest. 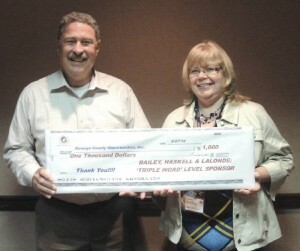 Bailey, Haskell and LaLonde is a leading regional insurance broker with headquarters in Oneida. The company currently employs more than 90 people in eight locations throughout the east coast. BHL’s roots go back 100 years in Madison, Oneida, and Onondaga counties. There is still time to register a team in Scrabble Fest’s fun, fast-paced competition. Teams consist of four players, who work together to create words during three turns in each of the four 20-minute rounds of play. Team scores will be tallied and the top three teams will be awarded prizes. To add to the fun of the event, there will be special prizes for the most pledges raised (team registration is not considered pledge money) and for team spirit. In addition to the Scrabble competition, Henderson said that there will be a silent auction featuring some great items donated by local merchants who support LVOC, a 50/50 raffle and a lottery ticket drawing. New this year: Golden Tiles will be available at $20 each and may be used as blanks by the purchasing team during each round of play. Maximum of two Golden Tiles per team. Also, each team that brings in $100 or more in pledges will receive 25 bonus points for their score. The team with the highest total amount (more thanr $100) will receive 100 bonus points. Literacy Volunteers is also kicking off a fall raffle at Scrabble Fest, with a grand prize of four Disney Park Hopper Passes. Tickets are $5 each or 5 for $20. Prize drawings will take place at the end of October. Doors open at 5:30 p.m., welcome is at 6:15 p.m. and games begin promptly at 6:30 p.m. Entry fee is $100 per team and includes light refreshments. The cost for spectators, those who want to attend but not compete in the event, is $15. This fee includes light refreshments. All proceeds from Scrabble Fest will benefit LVOC. Operating under the auspices of Oswego County Opportunities, LVOC provides confidential tutoring services at no cost to the student. Tutoring includes basic literacy (reading and writing), English literacy to improve English speaking, reading and writing skills and some simple math and computer skills.